Welcoming Heather & Ryan's Santa Baby! Heather & Ryan are an adventurous couple that loves to travel. In fact, just last winter they were exploring Antarctica on their honeymoon. Their winter celebration theme is still going strong as they celebrate their “Santa “Baby” shower this December at Sol Cocina in Playa Vista. They may be at the beach, but we’re totally feeling winter wonderland vibes! Heather wanted a traditional Christmas color palette of green, red, white & metallics. We achieved this with two 3 ft. balloon Christmas tree sculptures and a balloon present. 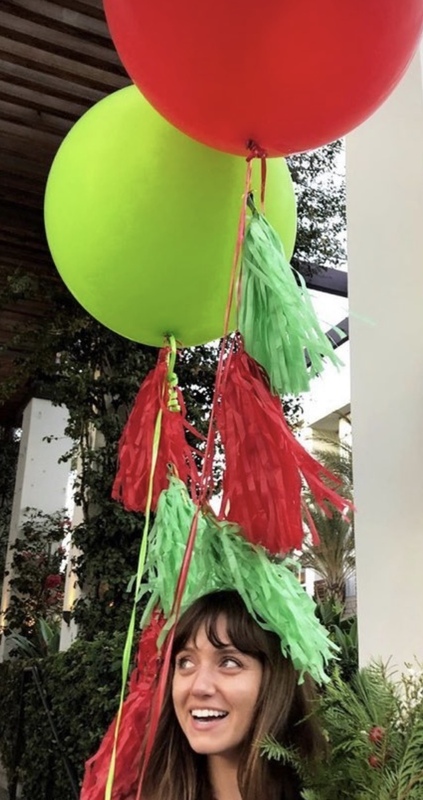 We also created green & red tassel balloons for a modern, playful aesthetic. We love how the balloons paired seamlessly with the other decor, including: black boot vases with holiday greenery and holly, light-up white, wood blocks which read “Santa Baby,” plenty of colorful, holiday garlands, and a sweet Santa Baby Cake studded with candy and a custom topper. Not to mention, the dessert table had a full backdrop of TEQUILA! Felix Navidad, friends! Enter your email address to learn more about our promotions & to receive our newsletter!